On May 2, 2016 the Batumi’s Grand-Prix was finished. Thanks to the victories in the last two rounds, I was able to finish the tournament on the clear 2nd place with 6,5 points out of 11. 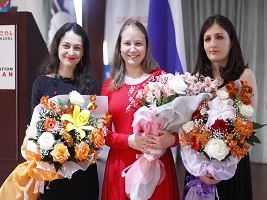 Valentina Gunina won the event, Nino Batsiashvili took third place. Hello everybody! 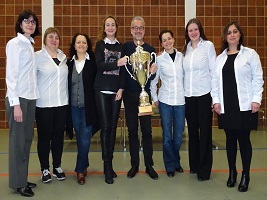 Just wanted to let you know that on March 20, 2016 the OSC Baden-Baden team for which I play won the women’s Bundesliga title for the 2015/2016 season. I want to congratulate the whole team – and our captain Thilo Gubler on this victory! 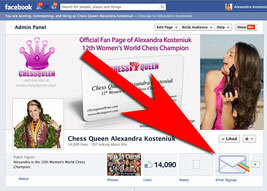 Chess Queen™ Alexandra Kosteniuk – the 12th Women’s World Chess Champion – would like to wish most happy holidays to all of you, wherever you are in the world. Celebrate with happiness and joy in your hearts. Let the season be full of kindness and love, and make sure to play some great chess too! Season’s Greetings and Happy New 2014! 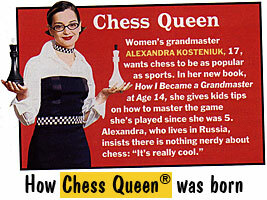 Lots of people have asked me why I’m called the “Chess Queen”, so I decided to write an illustrated post about it. It all started in 2001, when I was 17 years old. My rating was 2469 and I had the titles of Woman Grandmaster (WGM) and Men International Master (IM). Many people know that I love playing blitz chess, from my YouTube channel and from my DVD “Chess Blitz Fever“. Yesterday I played in what may be the one of the strongest blitz open tournaments ever, the Aeroflot Blitz Open, with over 270 players, of which 107 players were Grandmasters, and in total 182 titled players. Ian Nepomniachtchi won with 15.5/18 followed by Peter Svidler and Grischuk. I was the best woman with 11 points and the 48th rank, followed by Harika 72nd, Tatiana Kosintseva 92nd, Lahno 93rd, Zhukova 117th. It was a tremendously strong tournament. My performance was 2632, which makes my FIDE rating go from 2581 to 2612 in the next Official March 1 FIDE Blitz Rating List, that’s a new record for me! You can see my detailed results and the complete rankings. My best result was to beat 2-0 each in our mini-matches GM Bukavshin (2697) and GM Kobalia (2636). 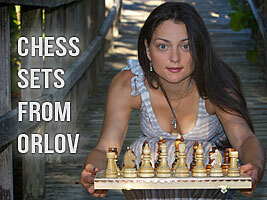 See also the reports by top USA blogs ChessBlog, ChessDom, and Chessvibes. NEW! 3 GAME VIDEOS POSTED BELOW! I had great success last year playing chess tournaments, and was able to increase my FIDE Elo ratings by more than 100 Elo points on average from January 2012 to January 2013. 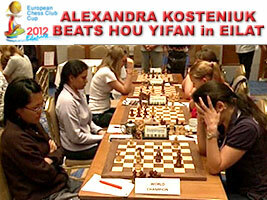 You can see my FIDE rating card here. My ratings are now as follows: Classical: 2495, Rapid: 2575, Blitz: 2581. I hope to do well also in 2013, I’ll also be training a lot and playing many tournaments. Hello everyone! I am working on a Newsletter in which I will let you know about my results, games, videos, activities, and offer super chess discounts for my Chess King Training suite of products. I will also run competitions with prizes, and inform you of how I am playing and where you can watch my games, in an applet or in video. 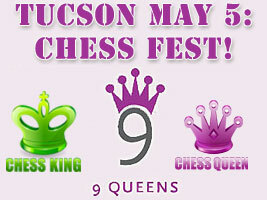 You can sign up at one of several places, here on www.chessqueen.com (right column), www.chessblog.com, www.chess-king.com or www.facebook.com/chessqueen. It’s enough to subscribe just once, just make sure you confirm you want to subscribe when the conformation email comes. 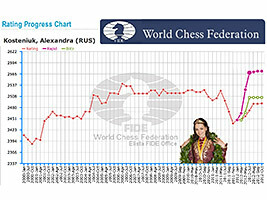 The FIDE Chess ratings for October 2012 have just come out. After last year’s not so good results that saw me go from 2522 down to 2439, this year has been much better, and I’m now back to 2490 Elo, with my Rapid rating at a very respectable 2572. You can see my rating progress in the image below. 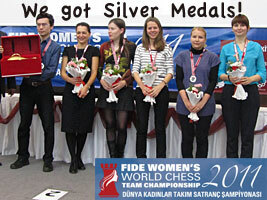 This year’s events so far have been: World Rapid and Blitz Championships in Batumi (Silver and 4th place), European Championship in Gaziantep (11th in Classical and Silver in Rapid), Russian Team Championship in Sochi (2nd on 1st board), Kazan Grand Prix (5th), Russia vs. China match in Saint Petersburg (top women result), Swiss Individual Mixed Championship (Bronze), Blitz Match vs GM Wang Hao in Biel (1.5-0.5), Istanbul Chess Olympiads (Gold Team Medal and Individual Bronze Medal). This year I still have in October the European Club Cup in Israel, then in November the World Championship in Russia, and finally the Sport Accord Mind Sports Games in December in China. A lot of chess events this year! 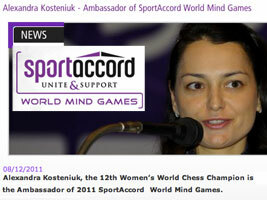 Press Release: On July 20, 2012 the Russian Minister of Sports V. Mutko signed the decree [translation] to name 12th World Chess Champion Grandmaster Alexandra Kosteniuk “Well-Deserved Sports Master of Russia” (in Russian “Заслуженный мастер спорта”), which is the highest title awarded by the State in honor of sporting achievement. The news came out on the site of the Russian Chess Federation [translation], on the Izmailovo Center page, and congratulations are flowing on Alexandra’s Russian Twitter page @kosteniuk. Today June 30, one day early, FIDE published the new chess rating lists. 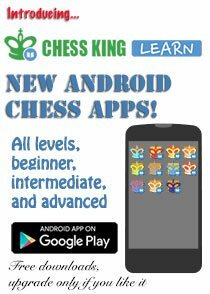 The big novelty is that new Rapid and Blitz rating lists have been inaugurated! So each player who plays all speeds of chess will have 3 ratings. 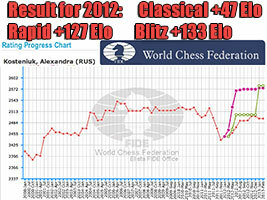 In my case (see Alexandra Kosteniuk’s official FIDE rating page), on July 1, 2012 I will have 2472 ELO for classical chess (that’s +15 vs. last list), and I enter the Rapid list with 2568 ELO, and the Blitz list with 2505 ELO, which gives an average of 2515 ELO. I think that it is a great idea to have different rating lists for different styles of chess (classical, rapid, and blitz), as it is a fact that players have different success in different styles of play. In my case, I am close to 100 ELO stronger in rapid chess, which was obtained in having good success in most recent top level Rapid tournaments. Do you agree it is a good idea to have different chess ratings for classical, rapid and blitz chess? 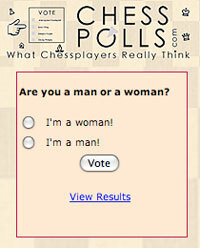 Please write your opinion in the comments or vote on the issue on www.chesspolls.com. I just want to share with you some nice photos taken today with a nice Andalusian Chess Set I recently got from ChessMaze International. 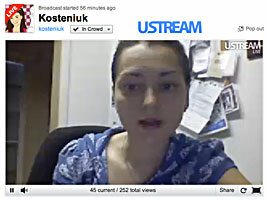 Many people have asked me to help comment live chess games as they happen, so I opened an account with Ustream with nickname “Kosteniuk” (www.ustream.tv/user/kosteniuk). On Tuesday I made a broadcast in Russian, and today in English. Ustream keeps recordings of the broadcast, you can watch the English one here. During the broadcast I was commenting the LIVE games of Wijk aan Zee (live link here) and of Gibraltar (live link here) and answering any questions that were coming in the chat or via the social sites. Follow my Twitter and Facebook to hear about next broadcasting days and times. 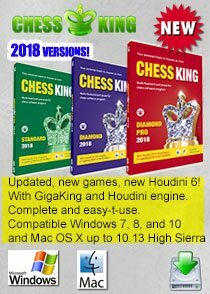 The best selling chess software combos Chess King and Chess King Pro (which include Houdini 2 and the huge GigaKing game database) and Chess King Training today have become even more affordable with a special “Free Shipping” offer until the end of January (regardless of where you live). Take advantage of this offer and get one for yourself of for a loved one. 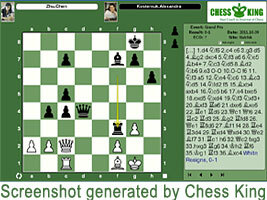 The Chess software Chess King has been top selling on the USCF web site and around the world. 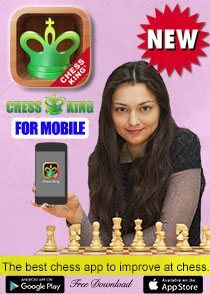 The $50 coupon code “INTROKING50″ has been extended so that more people can get it for $49 instead of $99 (and Chess King Pro for $99 instead of $149 for people who have a PC with at least 2 cores and wish to have the strongest chess program possible). 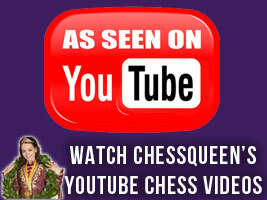 To find out more about Chess King, watch the ad below, or check the description, the tutorial, the FAQ, or the help page. 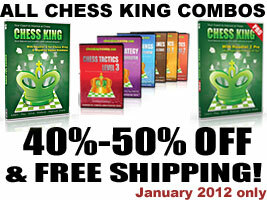 Buy any of the free shipping combos, and any of the Chess King packages. 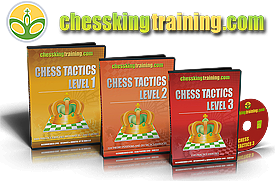 We highly recommend the Chess King Training software disks in addition or complement to the Chess King system. Following the June 2011 press release about my collaboration with exclusive watchmaker Pasquale Gangi, the day finally arrived (on January 15, 2012) when 5 numbered specimens of the famous chess pocket watch were created and ready to be presented to the press and to the public. This happened at the Geneva Salon International de la Haute Horlogerie. I was full of emotions holding in my hand such a jewel, especially thinking it was created to time chess games. Let me share with you my photo album of the event below. Feel free to email me with questions or post comments below. The last tournament of the year is over, one of the most prestigious of the year, the women’s world team chess championship, in Mardin, Turkey. It brought Silver medals to all members of my team, Nadezhda and Tatiana Kosintseva, Valentina Gunina, Natalia Pogonina and me, Alexandra Kosteniuk. In this event, the Chinese, with Hou Yifan, Ju Wenjun, Zhao Xue, Tan Zhongyi, and Zhang Xiaowen, were head above the others, and deserved the Gold. Georgia got Bronze, with Dzagnidze, Javakhishvili, Khotenashvili, Khurtsidze, and Melia, Congratulations to all! See below for some photos of the event. 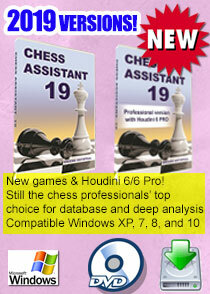 As you know, Chess King with Houdini 2 , the new affordable professional chess software, has been out for about a week and we are shipping it worldwide. My husband and I and a great team of chess programmers have been working on it for the last 2 years and we are very proud of the result, it’s powerful enough for a GM and simple enough for a kid to use, and has exclusive features not found anywhere (the random mode to prove you can win an won game is unbelievably useful). And the price of $49 (with coupon code INTROKING50) makes it an amazing value, since it includes the strongest chess engine in the world Houdini 2 and the biggest GigaKing Chess Games Database. We are continuing the deals below until the end of the year since they proved so popular. 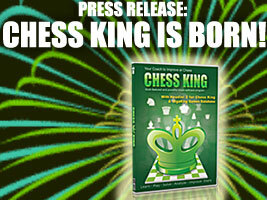 Read about Chess King (launch, tutorial) and get yourself a copy! I you know any kids around you, please share with them my chess comic. 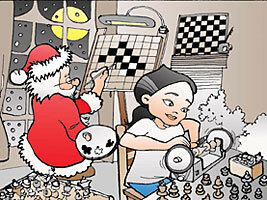 Remember that giving a chess set or a chess book or a chess program for Christmas is a great idea! P.S. See the full comic below. You can see or download for print all of my comics in several languages here. I am now at the Mind Sports Games in China, playing the third event, which is blindfold chess. This is one of the games I played today against Anna Muzychuk. One often wonders how one would play chess blindfold, and actually, as you can see from the game, one can play quite well! In the position below, I was happy to find the winning move (for me, playing black), can you? Below I have embedded a YouTube 26-minute interview made by the Spanish channel RT TV this year about me and about chess. If you speak Spanish you will enjoy it. If you don’t speak Spanish, head over anyway to my YouTube news channel “ChessQueenTV“, as you will find clips there in many languages. By the way, did you recognize the famous chess champion sitting in front of me in the photo to the left? I just found this 1:13 minute clip in English from the Mind Sport Games that are taking place right now and in which I am participating, both as a player and as the official ambassador of the event. Watch the embedded YouTube clip. 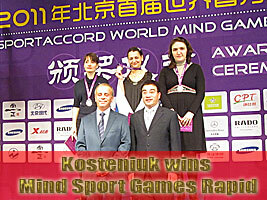 I just arrived in Beijing, China, and am very happy to participate in the 2011 SportAccord World Mind Games, which is like the Olympics but for intellectual Games. 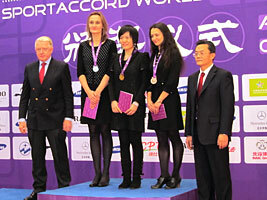 As you may know, I was honored to win the first Gold medal of the event in 2008 (news, Chinese news, final against Stefanova [game 1, game 2, game 3]). 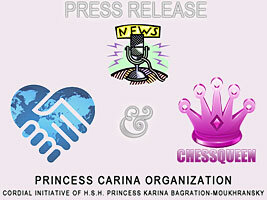 This year, I was elected the Ambassador of this prestigious event, and I feel very honored about that appointment. I’m playing the tournaments, and you can follow the results at the official site (home page, live games, YouTube). Wish me good luck! 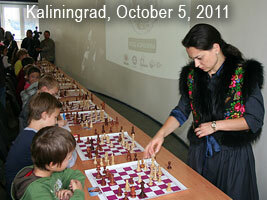 On November 26-27, 2011 in Svetlogorosk (Kaliningrad region, Russia) the 5th Alexandra Kosteniuk Chess Cup among kids U-6, U-8 and U-10 years old took place. 162 young players from 24 cities of Russia, Latvia and Lithuania took part in this event. Every single participant got prizes. The full table of the results of the tournament can be seen here. You can see photos of the event here and here. 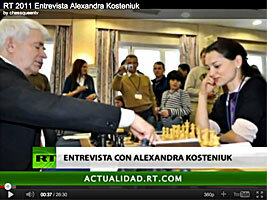 It was a great chess event and was strongly supported by the local authorities. The 6th Alexandra Kosteniuk’s Cup is announced and scheduled to take place again in Svetlogorsk from October 5 to October 7, 2012. I will post the regulations of this event here as soon as they are ready. 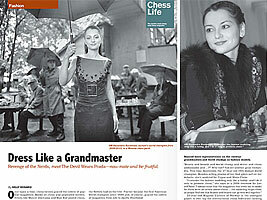 Nice surprise to see I was featured in the brand new December 2011 Chess Life Magazine, in a feature article called “Dress Like a Grandmaster” (click on the title to read it). Do you think chess players should dress nicely when they play a public tournament, or do you think it does not matter how they are dressed? Press (Facebook) LIKE if you think the 2 photos were well chosen by the editor of Chess Life, and write your comments to this post below. P.S. Check out my ARTICLES page (200+ articles) and my PHOTOS page (12,000+ photos). The new chess ratings of November 2011 are out. Due to not so great tournaments this year I’m at 2439, but dynamically I’m at +12 thanks to the great result at the recent European Team Championships in Greece. I now have 2 more important tournaments before the end of the year (the Sport Accord in China and then the World Team Championship in Turkey), so I hope to do alright overall. 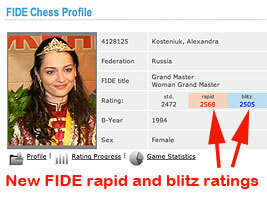 In my career, my best rating has been 2540 in 2006 and I reached 3rd woman in the world also in 2006. As for titles, I got the title of Grandmaster (men) in 2004 and the highest women’s title of 12th women’s world chess champion in 2008, defeating Hou Yifan in the final of the World Championship. 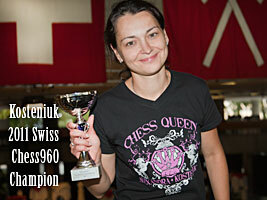 I am also the current women’s world Chess960 champion. 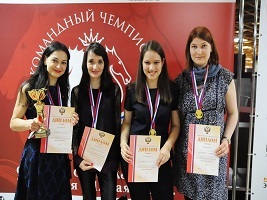 Breaking News: Our Russian national chess team just won the European Team Chess Championships! It was not easy! While our starting ratings were the highest and we were the favorites to win, it’s actually very hard to win when you are expected to win. 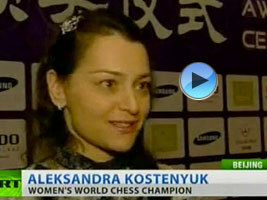 I know something about that, for sure, having been Women’s World Chess Champion. Everybody looks at the favorites and makes an extra effort to beat them. Well in this championship we were able to keep our cool the whole event, I’m so happy we won! I finally have posted the photos from my visit on September 2 to the Swiss Museum of Games in La Tour-de-Peilz, close to Vevey, Switzerland. In French it’s called “Le musée du jeu”. If you ever pass by the French part of Switzerland, I recommend you go and see the museum, which is in a great location close to the Lac Léman. You will be greeted by its Manager, Mr. Ulrich Schädler, who will show you the treasures (many of which related to chess, of course) it contains. See the official web site of the museum for exact address and hours of operation. Below you will see some photos from my visit. There are more photos in my Photo Album Page. Since Halloween is soon approaching, we’d like to share with you the famous Halloween photos of Chess Queen Alexandra Kosteniuk. 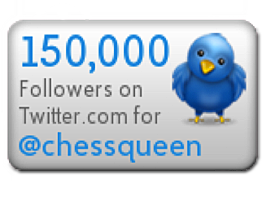 Feel free to share them with all your chess friends. Please click LIKE if you like them. (you can vote on the photos and see which ones are liked best). I visited the city of Kaliningrad on Wednesday for meetings to prepare for the “Alexandra Kosteniuk Chess Cup for Kids U-6, U-8 and U-10″, that will take place in Svetlogorsk (see tournament announcement) on November 26 & 27, 2011. I made a post in Russian at this link, but for the moment I will share with you some nice photos of that day trip below. Steve Jobs. Stay Hungry. Stay Foolish. I am very saddened by the news of the death of Steve Jobs last Wednesday. In a way, he has inspired many of us to be the best we could be, to create, and not to waste a minute of our lives. I particularly remember the graduation speech he made at Stanford University in June 2005. I made a Livejournal post on January 9, 2006 about it. 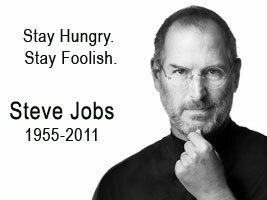 I continue to wish to myself, and to all of you to “Stay hungry, and Stay foolish”. 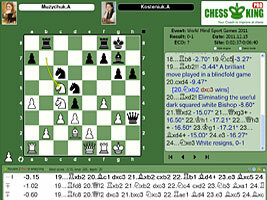 Below you can play over my game of the first round of the Nalchik Grand Prix. You can watch the games LIVE at this link every day from 3PM Moscow time (That’s Paris time + 2, or New York time +8). I have received lots of emails asking to explain my game against Olivier Kurmann from Leukerbad (Loeche-les-Bains) from this summer’s Swiss National Chess Tournament. In one variation I was ready to sacrifice my Queen (with the move 20. Nxe6!). So I made a video where you can see all the details of the combination that started with 16. c5! and culminated in my opponent resigning after 20. Qh6! A nice miniature, especially nice since I played 1. d4 on the first move, which usually leads to quiet games, but that was not the case in this one! 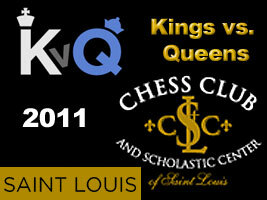 The beautiful Kings vs. Queens tournament, organized by the Saint Louis Chess Club is over. The Kings won by 31.5 to 18.5, with an impressive showing by Hikaru Nakamura who won the event with 9.5 out of 10! In second place is GM Ben Finegold with 7.5, then IM’s Marc Arnold and IM Jacek Stopa with 6.0. 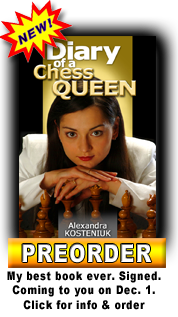 Chess Queen Alexandra Kosteniuk, who finished strong with 4 wins in a row, is top woman (Queen) with 5.5, followed by Kateryna Lahno 5.0, Irina Krush 3.0, Anna Zatonskix & Martha Fierro 2.5. The full table, photos and a nice video can be seen below. Here is the rapid chess game played today by Chess Queen Alexandra Kosteniuk against Jacek Stopa of Poland (ELO 2482), in the Kings vs Queens Tournament organized by the Saint Louis Chess Club. Alexandra won both games. The final results of the tournament will be available tomorrow. 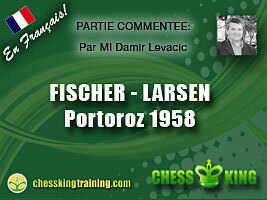 We share a YouTube video in French about the legendary game Bobby Fischer – Bent Larsen, Portoroz 1958. Thanks to Chess King French commentator Damir Levacic for his excellent work! If you like the video please click “thumbs up!”. Feel free also to embed onto your blogs. As you may know, each year I organize a tournament for kids, with many prizes and no entry fee, so I am glad to let you know that this year it will take place again! Today I am pleased to report that at the Biel Chess Festival I showed a good result in the 2011 Swiss Chess960 Championship, with a third place in the tournament and the best result by Swiss players. I am posting some photos below and soon will post the full table of results, as soon as it is available. As for my personal result in the tournament, I won against I. Lamoureux (2093), P. Lee (1876), GM Sebastien Maze (2578), FM Tom Weber (2324), and GM Christian Bauer (2637), drew against GM Boris Grachev (2680) and lost only to GM Tigran Gharamian (2670), total 5.5/7. I just came back from the 2011 Swiss National Chess Championship in Leukerbad, Switzerland. It was won by GM Bauer with 7.5/9, followed by GM Sokolov 7 points. 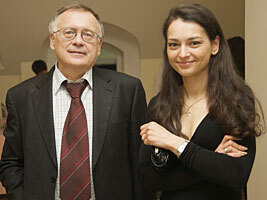 The best Swiss were the amazing Viktor Korchnoi (men) with 6.5 and Alexandra Kosteniuk (women) with 5.5. While I am not happy with my result (I started quite well with 4/4, but had a horrible end of tournament), I nevertheless had a great time in Switzerland (especially spending time with Viktor and his wife Petra) and played some nice games at the beginning of the tournament. 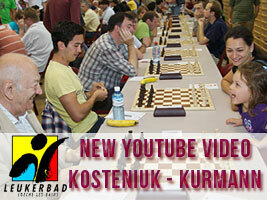 I will soon post a nice game I won against Kurmann in that event. More photos, statistics, to come soon! 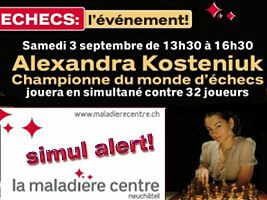 Tomorrow I’m off to Biel to play the Chess960 and Rapid events! 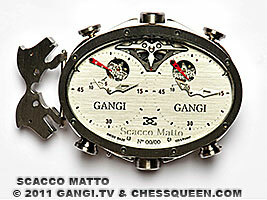 It is my pleasure to announce my partnership with the Italian creator and Swiss watchmaker Pasquale Gangi in giving birth to the most exclusive chess pocket watch ever made: Scacco Matto GMT3! A competition was held to select the best artists for this project and I am very pleased of the result, I hope you will like it too. I’ve long felt that it is important to show our love of the game around us and to be proud of being ladies chess players. 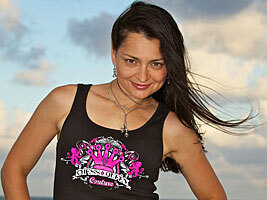 Chess Queen™ Couture embodies elegance and style, and is now available to be purchased by chess lovers around the world. 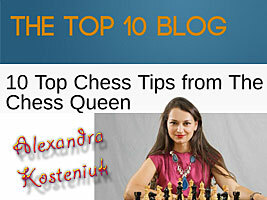 Today the site Top 10 Blog published my top 10 chess tips. I hope you find them useful. Let me know if you agree with the tips or would like to suggest more or different chess tips! Following my visit to the Chess factory in Orlov last month (see my previous post of the visit), I was asked to make a photo series to promote the company’s chess sets. A photo session was made yesterday with Pufichek (see other photos by Pufichek), and the result can be seen in this new photoalbum.